At the high point of what is now considered as 1960s ‘modernist cinema’, Ingmar Bergman was perhaps the central figure in the European art cinema movement. In the early 1970s I made several attempts to watch Bergman films, but I’m afraid I didn’t really enjoy the experience and my attention was drawn instead towards that now almost forgotten figure of a romantic political cinema, Bo Widerberg. I found Bergman’s films both bewildering and frightening. Their combination of psychology, philosophy and the crisis of belief didn’t appeal to my sense of youthful idealism and romanticism. A few years later, Bergman was still ‘important’ but often the subject of parody and satire. It wasn’t until Bergman’s death last year and the suggestion that we might mark it in some way that I thought about watching some of the earlier films that I had recorded but not watched (a common occurrence for film teachers?). I remembered that Jean-Luc Godard had been a big fan of Summer With Monika (Sweden 1953) and that Antoine Doinel and his friend steal a lobby card of Harriet Andersson in the film in a scene from Truffaut’s Les quatre cents coups (France 1959). I watched Summer With Monika with a sense of astonishment. Here is the prototype for Godard and Truffaut’s nouvelle vague youth pictures. 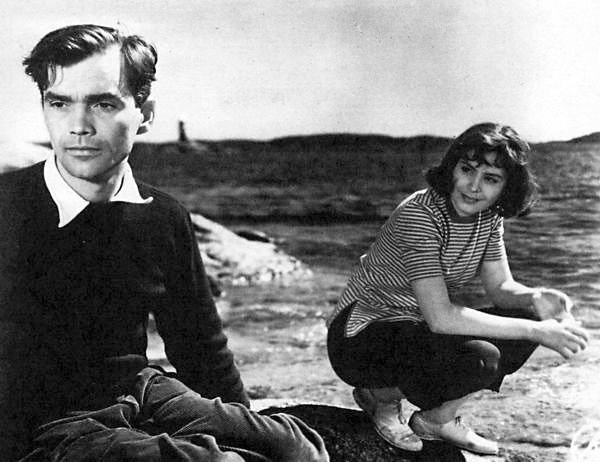 This is Bergman in Rossellini mode revelling in his young protagonists’ summer romance on the island around Stockholm. True there are indications of the darker Bergman to come, but overall, I found the film to be full of youthful vitality. So, when Film Four in the UK announced a Bergman season, I resolved to try and watch some of the films – the first one I caught was Summer Interlude. Summer Interlude comes across as a genre film – a romantic melodrama that could sits alongside late 1940s Sirk and Ophüls for me. It tells the story of a tragic summer romance, recollected in flashbacks by a prima ballerina during an enforced break in rehearsals. A messenger leaves a packet for her that prompts these memories of thirteen years earlier, when she met a young man on holiday in the islands and the fell in love during the long summer evenings. In this sense, it seems like a precursor of Summer With Monika. But it is a more complex film in some ways, with its nods forwards to Bergman’s later concerns about memory, death and lost faith. It’s an enjoyable film for anyone, but the auteurists must love it because of the familiar Bergman traits: the focus on the woman, the environment of the islands in the archipelago, the meeting with a wizard (the leader of the ballet troupe), the contrast of age and youth, confrontation with death etc. (and even a much parodied bird-call under the titles). It was Bergman’s original story, inspired by his own youthful experiences, but cut and shaped by the experienced Herbert Grevenius. Film Four certainly found a good print – the black and white location photography by Gunnar Fischer (who worked consistently with Bergman until 1960 when Sven Nykvist took over) is excellent. It contrasts with some of the expressionist use of lighting and set design in the interiors of the theatre and the summer houses on the island. Hamish Ford’s essay on the Senses of Cinema website.